Don’t be fooled by their smiles: these people are furious. The following pieces – the first from Lancashire, England, the second from Charlotte, upstate New York – are permeated with a sense of seething rage. Here’s what really happens when these things are threatened upon peaceful and prosperous rural communities. 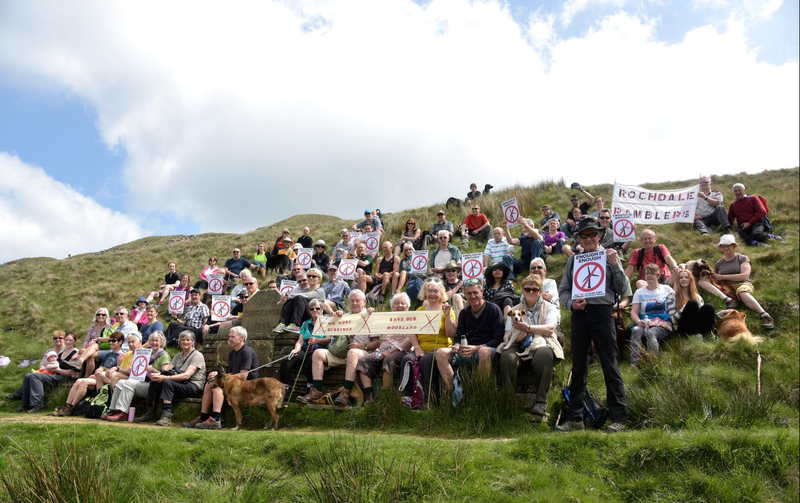 A PROTEST walk over controversial plans to build an extra 16 wind turbines at a Rossendale wind farm attracted over 100 people. Adults, children, babies and dogs came together for the walk from Cowpe Road in Waterfoot along the Pennine Bridleway to Waugh’s Well. 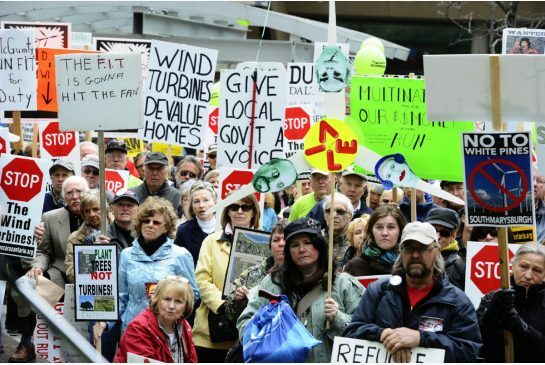 The walkers had protest banners against the proposed wind turbines for the four mile trek. The proposal was approved by Rossendale council’s development control committee last September after Peel Energy and United Utilities submitted the joint venture to expand the wind farm from 26 to 42 turbines, back in September, despite fierce opposition from campaigners. 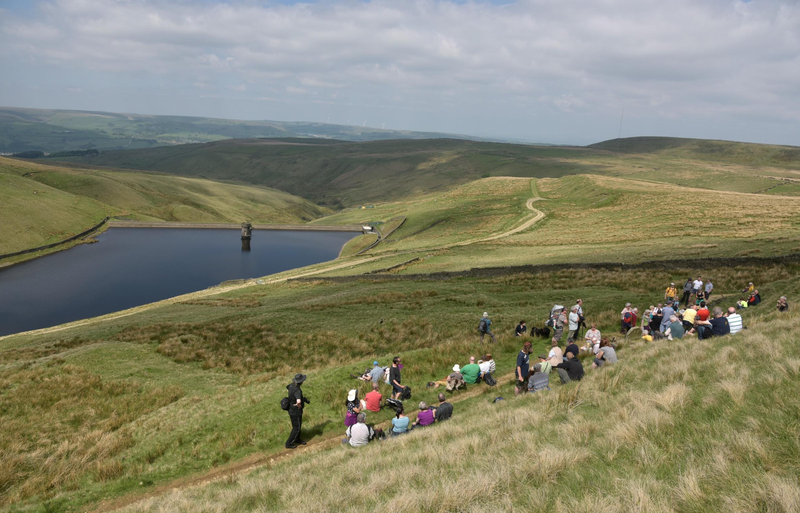 The site is on Scout Moor, between Rawtenstall and Edenfield, on open moor land that overlooks Bury. Protester Falmai Binns, who lives in Holcombe, said: “The walk went really well, it was astonishing how many people turned up. “You never know with these voluntary things how they are going to go but it was great. There were even mothers carrying small babies. “The views at the stop were spectacular and it really was a great sight up there which will be ruined by the extra turbines. “The amount of people that turned up just shows the strength of feeling against this. When they got to the top of the view point at Waugh’s Well, which was built in 1966 to commemorate Edwin Waugh, a successful Lancashire dialect poem, Holcombe resident Chris Woods a piece of work he had penned himself. Mrs Binns said: “I got quite emotional listening to the words of the poem about the landscape especially when you are stood there looking out on it, it’s a thing of beauty. The application has now been passed to the Department for Communities and Local Government and there will be an inquiry held in October to make a final decision on the plans. On the other side of the Atlantic, the story remains the same. CHARLOTTE – It’s a bird! It’s a plane! It’s … another wind farm coming to Chautauqua County? At a recent Charlotte Town Board meeting, resident Joni Riggle shared that she felt blindsided by the news that Charlotte would be following in Arkwright’s and Cherry Creek’s steps by working toward approval to build a wind farm. While she admits to it not being an “intentional blindsiding,” it doesn’t change the fact that that’s how she feels about it, and now she thinks it may be too late to share her grave concerns regarding the matter. “Wind turbines sound like these innocuous, you know, lovely things but not in a small, residential community. They’ve left a trail of destruction, heartache, (and they) ruin towns, and I see why. If they really cared about the residents, they wouldn’t sneak in and have you sign a confidentiality contract so that you can’t tell your neighbor they’re about to ruin your property, cause you so much stress from the noise, the strobe, the shadow flickering … and the health effects. All around the world, there’s a mass movement to stop it, and I think you’ve been duped,” said Riggle. Riggle then went on in detail about her extensive research, highlighting the health problems allegedly caused by local wind farms, the difficulty people have in their daily lives because of them and the number of complaints people in other areas have had about them in general. According to Riggle, Shirley Wind, a wind farm in Glenmore, Wisconsin had studies done by independent researchers, acoustical engineers and even by the wind company, and found that the turbine noise, even at 7,000 feet away, made people abandon their homes. The study found sound pressure levels that were observed to routinely exceed 95 decibels, periodically 100 decibels, which made it so that residents could not or did not want to stay in their homes. Then Town Supervisor Kenneth Bochmann spoke, and addressed the “blindsided feeling” Riggle had, stating that there have been multiple notices regarding meetings about the wind farm posted at the library and at the post office. Riggle said that she doesn’t go to the post office, prompting Bochmann to simply say that the town did what they were required to do. Essentially, according to Bochmann, Article X is involved in this new wind farm process. The wind farm cannot be approved by the state until all the boxes are checked in terms of how the farm affects an area visually, acoustically, audibly, medically, etc. but until then, the wind farm is still only in its planning stages, and it could take up to a year for the Article X study to be finished and for the application to be approved or denied. In terms of the wind farm itself, there’s a map that cannot be released until the application is submitted. However, there are 52 proposed wind turbines. Approximately 25 will be in the town of Charlotte, one in Arkwright and the balance in Cherry Creek. This arrangement is, according to Bochmann, based on megawatts. Despite the promising evaluations mandated by Article X, Riggle remains unconvinced. “This is so frightening. I don’t want to be strobed. I don’t want to be invaded by pulsating sounds, vertigo. We are human receptors for noise, for infrasound, for stray voltage, shadow flicker (and) vibration,” Riggle said. Hi STT, hatred and division for sure. STT, I would like to include a photo of an ad in our local paper if possible? See, Tuscola ad photo- via by email ? This article written by the editor of the Tuscola County Advertiser in the Thumb of Michigan is a must read. He took over this position maybe a year ago. I like this guy, bunches. Respectful, bold, factual, cool calm and collected, Willing to write the truth. —-NextEra sometimes will bring its sound and/or medical experts. Several area property owners with wind leases or ties to those with wind leases sit right next to them – at the ready to pledge their undying support and love for all things wind. “Excuse me, do not talk to me that way,” Mozden said to Vollmar, who I was sitting close to and could clearly be seen mouthing a series of explicit remarks at her. Interested to learn more about this dynamic of the meeting, I tried to ask Vollmar afterwards and in the parking lot of the township hall about why he appears to feel he has a right to tell people to “sit down and shut up” and curse at them. Unfortunately, he told me he didn’t want to talk about his comment during the public meeting after the fact and – after calling me names and telling me to “get the hell out of here” – accused me of “messing with” him and tried to call the police (he apparently couldn’t get a signal on his phone). This weeks ad, is lovely I think. Thank goodness for the relative few, in rural communities around the world, who are aware and courageous enough to stand up and make history as they defend the countryside from this U.N driven global agenda to relocate people to ‘human settlements’. We must stop the wind companies and governments in their tracks from even thinking they can impose these turbines on rural regions. Along with that effort the turbines already up and running and impacting rural people must be turned off. After that we’ll work on the dismantling and recycling. ‘What the world needs now…’ is a ‘rural renaissance’. Those who approve the building of wind turbines anywhere in the vicinity of living beings are quite simply cruel and heartless. As one of the people photographed in the Scout Moor protest many thanks for raising the profile of our campaign in Lancashire.